Robots Will Do Everything You Do Now Only Better—What Then? 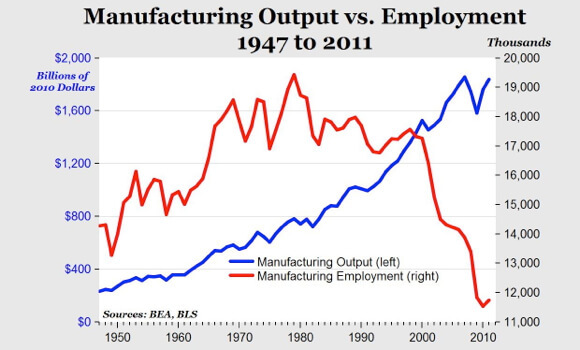 It’s rarely noted, but even as manufacturing jobs have steadily decreased, total manufacturing output has steadily grown. 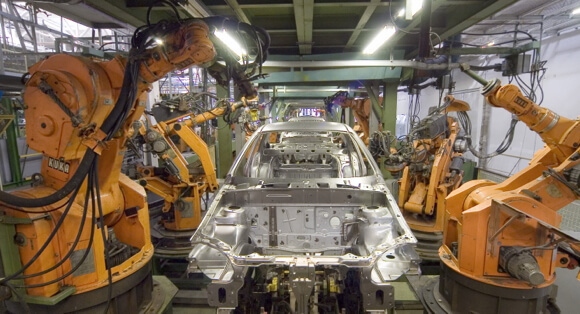 Since World War II, manufacturing output in the US has risen over 700%. While rising productivity is often demonized as a job killer, in truth, it is a very powerful force for good in the modern economy. The time and creativity that productivity growth frees—and it’s been happening since the Industrial Revolution—is responsible for every modern invention from healthcare to high tech, smartphones to non-invasive surgery. If humans hadn’t started using machines to do some things for us, most would still be working in the fields with few moments to spare pondering economic theory, let alone inventing new technologies. One argument says that this time is different because soon robots will be able to do everything a human does. But it’s misguided to assume we can forecast what humans “will do.” What that statement really means is, “In the future, robots will do everything humans do today.” But what exactly it is that humans will do in the future is anyone’s guess—and few, if any, have ever successfully predicted it. We are gifted with the vision of our times and cursed with the temptation to extrapolate that vision into the future. How could our farmer know that in 2013 humans would be paid to make movies, pick up garbage, write online, build robots, clean bathrooms, engineer rockets, lead guided tours, drive trucks, play in garage bands, brew artisanal beer, or write code? The revolution in agricultural technology liberated vast resources and made us all richer and the economy more diverse as a result. And while one might think that those riches should have accrued to only those making agricultural tech, thus permanently widening the income gap, no such thing happened in practice. While those making agricultural machinery undoubtedly made some bucks, the next economic waves provided different work and income for many levels of skill and motivation. This is understandably a firebrand topic right now. If current unemployment marked the beginning of mass technological unemployment, you can be sure mass social unrest would be quick to follow. But we can’t prove it’s structural yet. Unemployment is a typically lagging indicator. (Click ‘show recessions’ here to see how unemployment continues long after recessions end.) In the last sizable downturn in the early 80s, unemployment didn’t drop below 7% for four years after the recession ended. And that preceded two decades of virtually unbroken growth. We don’t know precisely what the future holds, but we do know that most in the developed world—even the poorest—live longer, healthier lives than they did a century ago. And while the world will never be a perfect place, technology and productivity have freed more minds to ponder, play, and invent today than ever before. Jason is managing editor of Singularity Hub. He cut his teeth doing research and writing about finance and economics before moving on to science, technology, and the future. He is curious about pretty much everything, and sad he'll only ever know a tiny fraction of it all.